RYOBI introduces the 18V ONE+ Lithium-Ion Cordless Brushless 4-Tool Combo Kit with Drill/Driver, Grinder, Impact Driver, LED Light, (2) 1.5 Ah Batteries, and Charger. Equipped with everything you need to get the job done, the 4-Piece RYOBI 18V ONE+ Brushless Combo Kit provides superior control and performance. It includes a drill/driver, grinder, impact driver, LED light, two 1.5 Ah batteries, and a charger. Bit changes are a breeze with the innovative brushless drill/driver, while the impact driver delivers up to 2,000-Inch/lbs. of torque for demanding applications. The included compact batteries mean you will never run out of power. All of these tools work with RYOBI 18V ONE+ batteries, which support more than 125+ superb RYOBI tools. 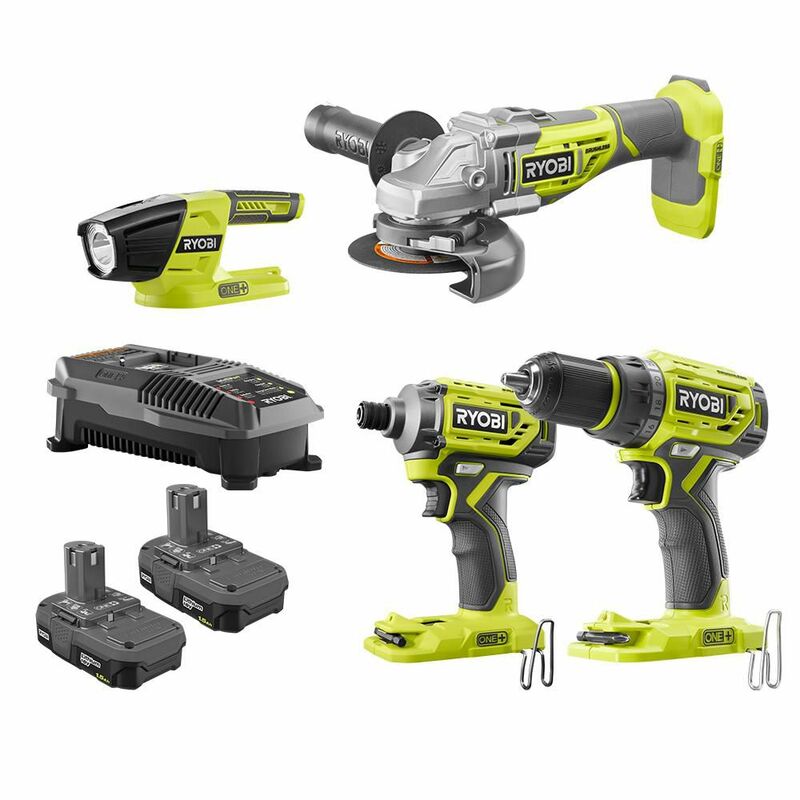 Backed by the RYOBI 3-Year Manufacturer's Warranty, this Brushless 4-Tool Combo Kit includes a drill/driver, impact driver, angle grinder, LED light, two 1.5 Ah batteries, a charger, and an operator's manual. The 2892-22CT M18 2-Tool Combo Kit includes the 1/2-Inch Compact Brushless Drill Driver (2801-20) and the 1/4-Inch Hex Compact Brushless Impact Driver (2850-20). The M18 Cordless System's patented technologies and electronics, innovative motor design, and superior ergonomics provide the most efficient blend of power, weight and performance in the industry. The M18 Compact Brushless Drill/Driver is the Most powerful compact 18-Volt drill on the market. The M18 1/4-Inch Hex Compact Brushless Impact Driver has the fastest application speed its class and delivers 1,600-Inch/lbs. of torque. Both tools feature Milwaukee built brushless motors, REDLINK Electronics, and REDLITHIUM batteries that provide more efficient power delivery, for fewer trips to the charger. The M18 Cordless 2-Tool Combo Kit includes the 1/2-Inch Hammer Drill Driver (2607-20) and the 1/4-Inch Hex Compact Impact Driver (2656-20). The M18 Cordless System's patented technologies and electronics, innovative motor design, and superior ergonomics provide the most efficient blend of power, weight and performance in the industry. Powered by RED LITHIUM the M18 cordless system delivers more torque, more power, and longer run-time than the competition. 18V ONE+ Brushless Combo Kit (4-Tool) w/ Drill, Grinder, Impact, Light, (2) Batteries and Charger RYOBI introduces the 18V ONE+ Lithium-Ion Cordless Brushless 4-Tool Combo Kit with Drill/Driver, Grinder, Impact Driver, LED Light, (2) 1.5 Ah Batteries, and Charger. Equipped with everything you need to get the job done, the 4-Piece RYOBI 18V ONE+ Brushless Combo Kit provides superior control and performance. It includes a drill/driver, grinder, impact driver, LED light, two 1.5 Ah batteries, and a charger. Bit changes are a breeze with the innovative brushless drill/driver, while the impact driver delivers up to 2,000-Inch/lbs. of torque for demanding applications. The included compact batteries mean you will never run out of power. All of these tools work with RYOBI 18V ONE+ batteries, which support more than 125+ superb RYOBI tools. Backed by the RYOBI 3-Year Manufacturer's Warranty, this Brushless 4-Tool Combo Kit includes a drill/driver, impact driver, angle grinder, LED light, two 1.5 Ah batteries, a charger, and an operator's manual. 18V ONE+ Brushless Combo Kit (4-Tool) w/ Drill, Grinder, Impact, Light, (2) Batteries and Charger is rated 4.4 out of 5 by 53. Rated 5 out of 5 by Javier from Great price for all the tools impact has lots of... Great price for all the tools impact has lots of torque. Rated 5 out of 5 by Bob from Brushless tools rule! Brushless tools rule! Rated 5 out of 5 by Wayne from I am very impressed with the tools and the... I am very impressed with the tools and the system. Moderately surprised at how heavy duty the impact driver is.